won the battle of the day, but lost their way of life." Dr. Joseph Medicine Crow is a Crow Indian historian and author. His writings on Native American history and reservation culture are considered seminal works, but he is probably best known for his writings and lectures concerning the Battle of the Little Bighorn. He is the recipient of the Bronze Star, the Chevalier Légion d'honneur on June 25, 2008, and will receive the Presidential Medal of Freedom at a White House ceremony on August 12, 2009. 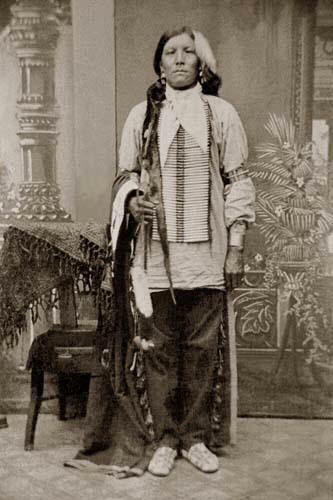 Medicine Crow is an enrolled member of the Crow Tribe of Indians. Medicine Crow is the step-grandson of White Man Runs Him, a scout for Gen. George Armstrong Custer, who was an eyewitness to the Battle of the Little Bighorn. He grew up listening to stories of the most famous battle of the American West. Joe Medicine Crow joined the U.S. Army during World War II and served in the 103rd Infantry Division. He said whenever he went into battle, he wore his war paint beneath his uniform with a sacred eagle feather beneath his helmet. During his service in WWII, Medicine Crow completed all four tasks required to become a Crow war chief: 1) touched a living enemy soldier; 2) disarmed an enemy; 3) led a successful war party; 4) stole an enemy horse. He is the last member of the Crow tribe to become a traditional war chief. "The collision knocked the German's weapon to the ground. Medicine Crow lowered his own weapon and the two fought hand-to-hand. In the end, Mr. Medicine Crow got the best of the German, grabbing him by the neck and choking him. He was going to kill the German soldier on the spot when the man screamed out 'momma.' 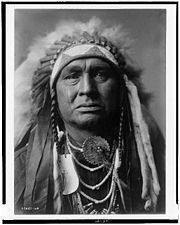 Mr. Medicine Crow then let him go." He successfully led a war party and stole an enemy horse when making a midnight raid to steal the horses from a battalion of German officers. Medicine Crow said he sang a traditional Crow honor song as he rode off. Medicine Crow is the first member of his tribe to have attended college. He received a bachelor's degree from Linfield College in 1938. He received a master's degree in anthropology from the University of Southern California (USC) in 1939. His Master's Thesis was titled The Effects of European Culture Contact Upon the Economic, Social and Religious Life of the Crow Indians . When he returned to Crow Agency in 1948, he was appointed tribal historian and anthropologist. He holds two honorary doctorate degrees, one from Rocky Mountain College in 1999, and the second from the University of Southern California (USC) in 2003. Dr. Medicine Crow is a guest speaker at the Custer Battlefield Museum, at Little Bighorn College and other colleges throughout the country. He has appeared in several documentaries about the Battle of the Little Bighorn. His books include: A Handbook of Crow Indian Laws and Treaties, and From the Heart of Crow Country: The Crow Indians' Own Story remains one of the most widely read resources on Crow culture today. He lives on the Crow Indian Reservation in Lodge Grass, Montana. Artworks and photographs within this website may not be copied or reproduced without written permission of the Custer Battlefield Museum.